Author(s): Sonia N. Apostolova, Reneta A. Toshkova, Albena B. Momchilova, Rumiana D. Tzoneva. Institute of Biophysics and Biomedical Engineering, Bulgarian Academy of Sciences, P.O. Box: 1113, Sofia, Bulgaria. The partial efficacy and high toxicity of the current anticancer chemotherapeutics as well as the development of multiple drug resistance are the major problems in cancer therapy. Therefore, there is an emergency need for the development of novel well-tolerated anticancer agents with different mode of action that could be successfully used in combination with other drugs as an adjuvant therapy. The inhibition of intracellular signaling pathways associated with cancer growth and invasiveness is a main therapeutic approach in cancer treatment. It is well known that lipid metabolism is involved in the regulation of key cellular processes such as proliferation, differentiation and apoptosis. 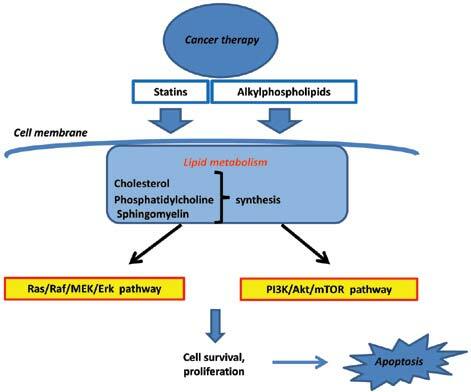 Statins and alkylphospholipids are both relatively new synthetic agents with considerable anticancer properties that disturb lipid metabolism and subsequently modulate proliferation and cell survival signaling pathways, leading to apoptosis. Numerous in vitro and in vivo studies have shown promising results for the use of statins and alkylphospholipids as potential therapeutic agents in the treatment of various human malignancies. However, more investigations and clinical trials are needed to assess their optimal safe dose and maximal efficacy and better understand the molecular mechanisms underlying the antitumor effects of these drugs. Keywords: Statins, alkylphospholipids, lipid metabolism, intracellular signaling, antitumor potential. Affiliation:Institute of Biophysics and Biomedical Engineering, Bulgarian Academy of Sciences, P.O. Box: 1113, Sofia, Bulgaria. Keywords:Statins, alkylphospholipids, lipid metabolism, intracellular signaling, antitumor potential. Abstract:The partial efficacy and high toxicity of the current anticancer chemotherapeutics as well as the development of multiple drug resistance are the major problems in cancer therapy. Therefore, there is an emergency need for the development of novel well-tolerated anticancer agents with different mode of action that could be successfully used in combination with other drugs as an adjuvant therapy. The inhibition of intracellular signaling pathways associated with cancer growth and invasiveness is a main therapeutic approach in cancer treatment. It is well known that lipid metabolism is involved in the regulation of key cellular processes such as proliferation, differentiation and apoptosis. Statins and alkylphospholipids are both relatively new synthetic agents with considerable anticancer properties that disturb lipid metabolism and subsequently modulate proliferation and cell survival signaling pathways, leading to apoptosis. Numerous in vitro and in vivo studies have shown promising results for the use of statins and alkylphospholipids as potential therapeutic agents in the treatment of various human malignancies. However, more investigations and clinical trials are needed to assess their optimal safe dose and maximal efficacy and better understand the molecular mechanisms underlying the antitumor effects of these drugs.